The two teams with the best records in the NHL Western Conference met last night. The Chicago Blackhawks controlled the play for nearly the entire game against the San Jose Sharks on Tuesday night, but still fell short. It’s pretty incredible then that San Jose came out on top last night. 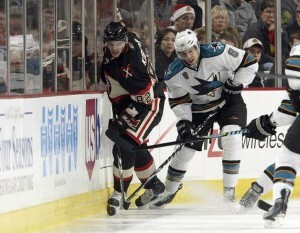 San Jose at 22-8-7 and 51 points has a slight edge over Chicago who has 49 points with a record of 23-9-3. I will add that Colorado, Nashville, and Los Angeles are close behind with points totals of 48, 47, and 47 respectively. At the beginning of the 2009-10 NHL season was predicting those three teams to be doing well. Or that the Detroit would be 9th in the Western Conference with a record of 18-13-5-41. Injuries and age have taken the Red Wings down a few notches. It is still early for teams to turn around or go into a slump. The Pittsburgh Penguins weren’t looking much like a playoff team around Christmas 2008. We all know who won the 2008-09 Stanley Cup, don’t we. My personal prediction- I think San Jose will be the west’s #1 seed, Chicago #2, and Detroit will make the playoffs.